Blinding mates with your camera flash? We're spoilt for choice with compact digital cameras, and it's hard for photo firms to make their snappers stand out. They used to go in for shouting about their megapixel count, but with punters realising that more megapixels don't necessarily make a better camera, manufacturers have to find other features to impress. The F30 features an extra-high light sensitivity - or ISO rating - up to an unprecedented 3200 at full resolution. This means that the camera can practically see in the dark, taking attractive photos in shadow, or the middle of the night, without needing to use the flash. That's the good news but, as ever, there's a price to pay. As camera enthusiasts will know, the price of higher ISO settings is increased noise - speckling and graininess in the darker areas - as the smaller sensor struggles to cope. While Fujifilm has done well to keep the noise down at the higher ISO levels, it's a problem at ISO3200, and it's the kind of noise that's hard to remove with software. On the other side, you don't need to go as far as 3200 to take advantage of the low-light capabilities. It takes good shots at ISO 400 to 800, which is much better than you normally get with compact cameras in this price range. Many users will put up with noise in return for not having to use the flash. Another advantage of higher ISO is reduced camera shake, especially at a shutter speed of 1/250th of a second. Other selling points of this attractive compact include a 6.3 megapixel sensor, choice of colour modes and impressive battery life. 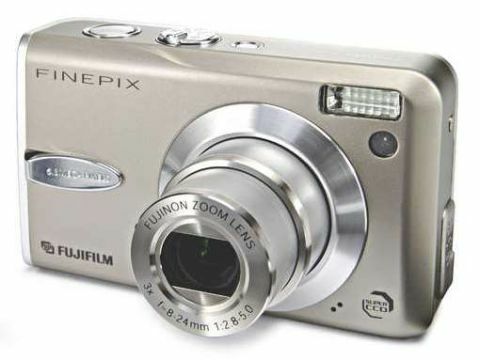 The Fujifilm is easy to use, too, with clear menus and a generous LCD viewfinder.